The ruling class across Europe has been dealt a massive blow by the vote of the UK to leave the European Union. This was a working class revolt against the establishment. UKIP and the Tory right will try to claim this as their own victory, but working people have no interests in common with them. The first casualty of the referendum result is David Cameron, who has already announced that he will resign by the Tory conference in October. However the Tory Party will want to replace him with a leadership election, not a general election. Jeremy Corbyn and the trade union movement should demand a general election is held immediately, and take up the frustrations felt by ordinary people at insecure work, zero hour contracts, job losses, cuts and austerity. Corbyn should cut across the racism of the Tories and UKIP by standing on socialist policies and renationalising rail, electricity, gas, post and other key industries. Cameron out now – not in October! 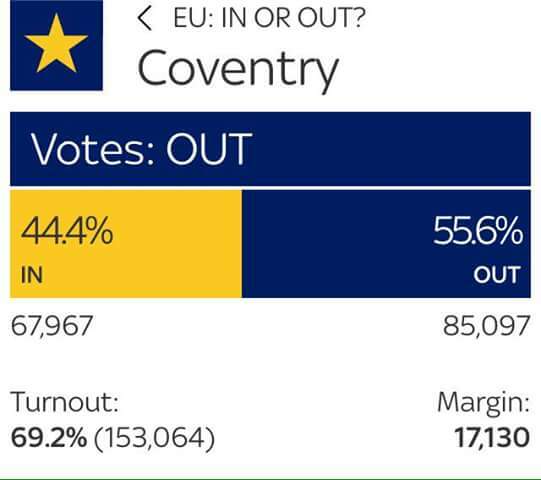 Coventry Socialists campaign for a general election – say NO to a Tory coronation!